You are here: Home / 2015 / August / 10 / WAKE UP, AMERICA! Believe it or not, this image– on a piece of sheet music I picked up in the Friends of the Starkville Library 50⊄ room a couple of months ago– has a presence on the World Wide Web. It’s easy to find, as is information about the lyricist, George Graff, Jr. He has a Wikipedia page!! If you’ve ever hummed, “When Irish Eyes Are Smiling,” you’ve hummed one of George’s songs. In 1916, Woodrow Wilson campaigned for his second term on the basis of having maintaining a position of non-involvement in the war. The song “Stonewall Wilson,” by Robert Mortimer, portrays the President as a strong, picturing him in uniform and leading soldiers on the sheet music cover, while the point of the song is that he kept the country at peace. This mixed political message shows a president that can lead in war, but only if absolutely necessary. There were voices of those who opposed the peace movement and saw frightening consequences if the United States did not enter the war. 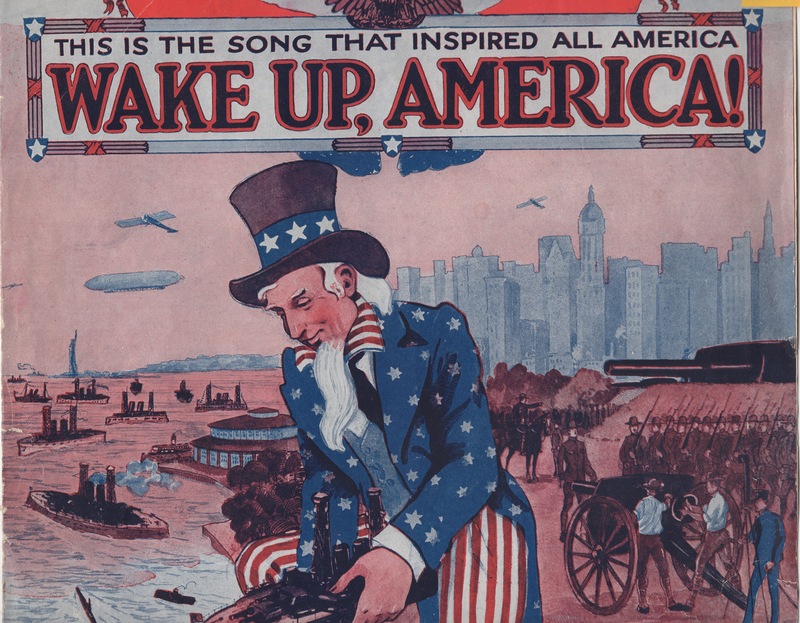 For example, a recording made in 1916 by Frederick Wheeler, “Wake Up America,” demonstrated that many realized that the United States would have to send troops to Europe. When the United States declared war with Germany in 1917, partly in response to German attacks on United States shipping, it was realized that the popular attitudes about the war needed to be turned around. Songs were one means of changing people’s minds. that you may find some stuff that happened in the past offensive. No kidding. History is literally littered with offensive stuff. You know, if I were a Libertarian with a big L and liked history and I knew how to write, I would write a little American history book for home-schooled kids of about ages 7-15 in which everything that anyone from the 1600s until the present day ever did that lined up with my big L-Libertarian self-reliant admiring self would be presented in the active voice. And every single damned thing that freedom-hating welfare-state loving think-i’m-better-than-you person ever did would be written about in the passive voice. But alas. Though I am a big L-Libertarian, and I only play a writer on this here blog.